Former Sri Lankan president Mahinda Rajapaksa’s interview to the influential Indian English daily “The Hindu” has caused quite a splash among political circles in Sri Lanka. The ex- president was interviewed by Suhasini Haidar and Amit Baruah for the newspaper which has acquired a reputation over the years of being the most authoritative voice on Sri Lanka related issues in the Indian media. Incidently Suhasini Haidar is the daughter of maverick Indian politician Dr. Subramanian Swamy who displays consistent interest in the affairs of the Island nation. She is the diplomatic affairs and deputy resident editor of “The Hindu” in New Delhi. Suhasini whose forte is international relations has frequently complemented the efforts of Meera Srinivasan the current Colombo Correspondent of “The Hindu” in reporting on Sri Lanka. Amit Baruah too is an old Sri Lanka hand having worked as the newspaper’s Colombo correspondent earlier. He is now the resident editor of “The Hindu “ in New Delhi. It could be seen therefore that the Mahinda Rajapaksa interview was conducted by high -powered journalists who were well-informed about Sri Lanka. “I will lead the SLPP. There is a view that despite the Amendment I can fight elections and then fight it out in court. Mahinda’s response to the queries revealed the present mindset of the man known as the Medamulana Machiavelli on the crucial question of who would be fielded as the joint opposition candidate at the next presidential elections. Since consistency is not necessarily a virtue in politics and also because politics is always regarded as the art of the possible these views may very well change at a different time. At present however the answers encapsulate Mahinda’s thoughts on the matters concerned. The essence of his answers can be broken down and placed in perspective in the following manner. Firstly Mahinda Rajapaksa would lead and spearhead the electoral campaign on behalf of the Sri Lanka PoduJana Party(SLPP). An answer to an earlier question indicates that there would be no partnership with the Maithripala Sirisena led Sri Lanka Freedom Party (SLFP). The only seemingly available option for Sirisena led SLFP is to join up and merge with the SLPP. Secondly Mahinda is yet undecided on whether he should contest presidential elections notwithstanding the 19th Constituional amendment. There are some in the Mahinda camp who opine that the ex-president could contest again. The two options being toyed with are either to seek an early ruling from the Supreme court on this issue or to wait for the poll , be nominated as a candidate and then fight it out in courts seeking a favourable decision from the judiciary. This however amounts to political brinkmanship and Mahinda faced with a Hamlet-like dilemma keeps pondering on whether to take the risk or not. Mahinda makes it clear that the decision will be his and his alone. Thirdly there is the other choice of nominating another person as the candidate. Given the very solid opinion expressed by several reputed legal eagles that the 19th Amendment conclusively debars Mahinda from throwing his hat into the presidential poll ring, this alternative choice could be perceived as virtual Hobson’s choice. Interestingly Mahinda places a caveat. He says “Another option is to announce a candidate acceptable to all”. What this means is that the candidate should be acceptable to all shades of opinion within party folds as well as the voting constituency. What is left unsaid here is that a controversial person who is unacceptable to a broad spectrum and may cause divisions cannot be the candidate. Fourthly is the reply to the query as to whether the prospective candidate would be a member of the (Rajapaksa) family or someone outside it. Mahinda’s answer has many layers to it but what is of great significance is what he did not say. He simply ignored the part about a potential candidate outside the family. What this implies is that whatever the problems or squabbles within the Rajapaksa clan, the ultimate choice would be a family member. This rules out the potential candidacy of Joint Opposition leader Dinesh Gunawardena and the political hallucination of Maithripala Sirisena that he could be the common candidate of a Joint opposition – SLPP – SLFP combine. 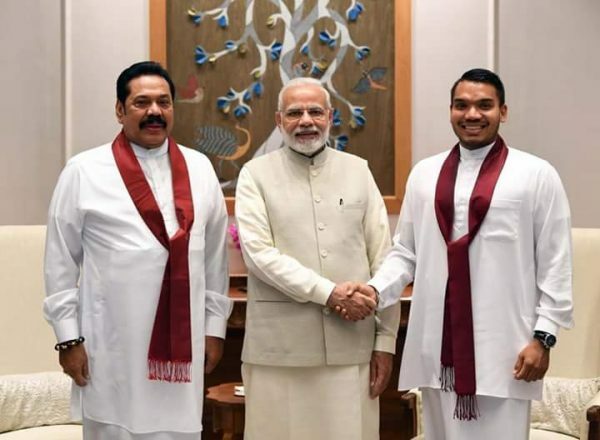 Fifthly it appears that Mahinda’s first thought is of Namal Rajapaksa alone when the question of a family member being a candidate is posed to him. Mahinda the ‘brother’ does not think of his siblings first but Mahinda the ‘father” first thinks of his eldest son only. He laments the fact that the 19th Constitutional amendment has raised the age limit of a presidential candidate to 35. Namal born on April 10th 1986 will only be 33 in 2019. This rules out eldest son and political heir apparent Namal Rajapaksa as a presidential candidate. Since the other two sons Yoshita and Rohitha are even more younger than Namal there is no way that the presidential candidacy could got to a son of Mahinda. The next choice therefore is a brother of Mahinda. Sixthly is the question of a brother of Mahinda being a contender. Mahinda says in the interview “ My brother is certainly a contender, but the party and the coalition will have to decide who the people want.” This brings up the question of who the “contender brother” is because no name is mentioned specifically Since former defence secretary Gotabhaya Rajapaksa is already in the running for the presidential candidacy stakes it has been automatically assumed that the reference was to Gota. Doubts were raised in circles hostile to Gota that Mahinda had referred to his elder brother Chamal as the contender because both younger brothers Gotabhaya and Basil are dual citizens with US citizenship and are therefore ineligible to contest due to 19 A. In order to clarify this point I contacted Ms. Suhasini Haider who along with Amit Baruah interviewed Mahinda in New Delhi. I asked her whether Mahinda had mentioned the name of any one explicitly when saying ‘my brother is a contender’. Suhasini replied “I don’t think so, but everyone assumed the conversation was about Gota”. She kindly checked out her recording of the interview and reverted back to me. Suhasini said that in her question she had mentioned “your brother” to which Mahinda had replied “ my brother is certainly a contender”. It appears therefore that neither the journalists nor Mahinda had specifically named any brother but it was implicitly understood by both parties that the brother reference was to Gotabhaya Rajapaksa. What this means is that the prospective candidate must be acceptable to a broad constituency and that the decision on a candidate must be endorsed by the Pohottuwa party and the Joint opposition coalition. It is illuminating that Mahinda steadfastly refrains from publicly naming his ex-defence secretary sibling as the candidate despite strenuous efforts by the pro-Gota lobby. In this instance the stipulated conditions are double-edged as far as Gotabhaya Rajapaksa is concerned. Will Gota be endorsed by all shades of opinion in the SLPP and Joint Opposition? Gota may be acceptable to a large number of Sinhala Buddhists but will he be acceptable to substantial segments of the religious and ethnic minority communities in the Island? 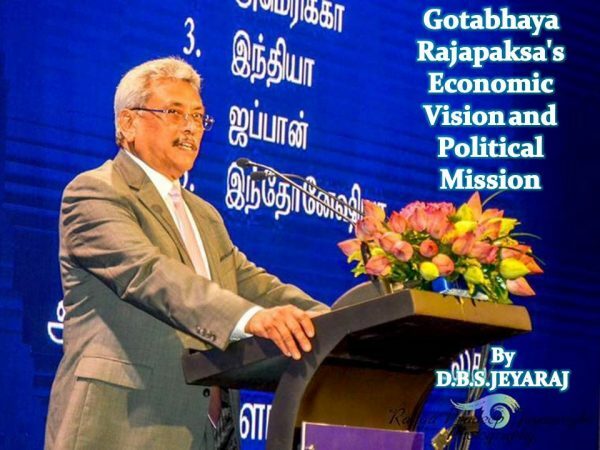 If the answers are positive then the presidential candidacy of Gotabhaya Rajapaksa is a certainty. If the answers are negative then there can be no firm decision on Gota being the chosen candidate. This prolongs the state of uncertainty The result can only be compounded confusion. All this brings us back to the succession stakes issue within the Ruhunu Rajapaksa clan.The ‘Medamulana Dynasty’ in this clan comprises the family members of former State Councillor and Parliamentarian Don Alvin (DA) Rajapaksa namely Mahinda Rajapaksa and his brothers Chamal, Basil and Gotabaya along with Mahinda’s son Namal and Chamal’s son Shasheendra. Although the ‘Ruhunu Rajapaksa’ family has been in politics for several decades starting from the days of the State Council, its ascendancy to the pinnacle of power came only in the new millennium. This became possible only after Percy Mahendra Rajapaksa, known to his country and the world at large as Mahinda Rajapaksa, became Sri Lanka’s fifth Executive President on November 18, 2005. Thereafter, the Rajapaksas established themselves rapidly as the ‘numero uno’ family in Sri Lankan politics. Apart from Mahinda Rajapaksa as President, family members and extended family members monopolised plum positions. Various posts in different spheres — from Defence Secretary to diplomatic representative — were held by the clan. Some were elected to office while others were appointed. Some proved their capability by efficiently discharging their duties while others failed miserably demonstrating the negativity of nepotism. During the days of the Rajapaksa regime it was an open secret that no major enterprise or project could be undertaken in the island without the blessings of at least one Rajapaksa. In those days most movers and shakers in Sri Lankan society derived their power and energy from the Rajapaksa ‘generator.’ Opposition members alleged then that nearly 70% of the National Budget was controlled directly by the Rajapaksa siblings. Family bandyism was a way of life under the Rajapaksa dispensation. Mahinda Rajapaksa was an MP from 1970 to 77 and 1989 to 1994. He first tasted ministerial office in 1994. The 1994 elections saw the People’s Alliance forming a government. Chandrika Kumaratunga became Prime Minister and later President. Mahinda was first appointed as the Labour Minister and later Fisheries Minister in a Cabinet reshuffle. In 2001, the UNP formed the government while Chandrika continued to be President. Mahinda Rajapaksa became leader of the opposition. In 2004, the UPFA formed the government and Mahinda became Prime Minister. In 2005, the presidential election was announced. Despite many intra-party obstacles, Mahinda Rajapaksa secured nomination as the presidential candidate in the November 2005 elections. The “Tiger “ enforced boycott in the North and the East in 2005 helped Mahinda defeat Ranil in the presidential poll. Thereafter the Rajapaksa regime pursued the war against the Liberation Tigers of Tamil Eelam (LTTE) with ruthless determination. After many deaths and much displacement, destruction and despair, the war ended with the military defeat of the LTTE in May 2009. The Rajapaksas cleverly converted the war-victory euphoria into political victories in the 2010 Presidential and Parliamentary elections. The Ruhunu Rajapaksas perceived as the first family in Sri Lankan politics began ruling the roost in authoritarian mode. With the 18th Constitutional Amendment being passed, the two-term limit for contesting Presidential elections was removed. It appeared that the politically-invincible Mahinda Rajapaksa was set to rule Sri Lanka for life as President. When presidential elections were called ahead of time, party secretary and senior Cabinet minister Maithripala Sirisena defected and became the common opposition candidate. The January 2015 Presidential poll resulted in Maithripala Sirisena (51.28%) defeating Mahinda Rajapaksa (47.58%). A UNP-led coalition government was formed with Ranil Wickremesinghe as Prime Minister and Maithripala Sirisena as President. The 19th Constitutional Amendment re-imposing the two-term limit for the Presidency was passed. With Mahinda Rajapaksa being Constitutionally-debarred from contesting the presidency again, it appeared that the political fortunes of Ruhunu Rajapaksas were on the wane. A number of inquiries probing the alleged corruption and abuse of power by various Rajapaksa family members were initiated. Cases were filed in court and a few Rajapaksas like Basil and Namal were even imprisoned for short periods. Gotabaya Rajapaksa continues to wage many legal battles to ward off arrest and potential detention. In such a situation, many political observers felt that the writing was on the wall politically for the Ruhunu Rajapaksas. But that did not happen. Despite the adverse setbacks, the political stock of Ruhunu Rajapaksas continues to remain on par with ‘Medamulana Mahinda’ continuing to retain his position as the single-most popular political leader in the seven provinces outside the North and the East. 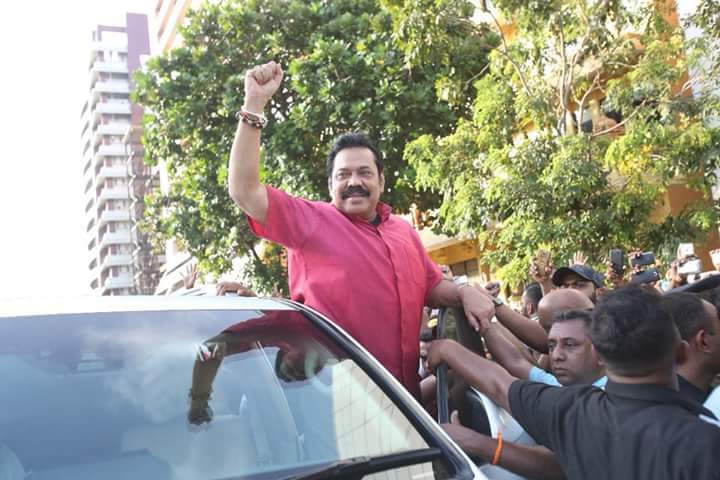 Moreover, the newly-formed Sri Lanka Podujana Party (SLPP) which revolves around Mahinda Rajapaksa has got the better of both the UNP and SLFP and emerged as the leading victor at the local authorities’ elections. Against that backdrop the Mahinda-led opposition seems confident that the days of the government are numbered and that the political resurgence and return to power of the Ruhunu Rajapaksas is inevitable. The Rajapaksa camp asserts boldly that either Mahinda or a suitable person nominated by him would be at the helm of Sri Lankan affairs soon. Speculation is rife that Gotabaya Rajapaksa endorsed and supported by Mahinda would contest and win the presidency. In spite of these rosy expectations the ground reality within the Rajapaksa camp was troubling. The main reason being the triple blows dealt by the 19th Constitutional amendment. The 19th Constitutional amendment reversed the 18th constitutional amendment by restricting the Presidential terms of office to two. Since Mahinda Rajapaksa had served two terms as President he was disqualified from contesting the Presidential elections again. This was the first blow. The 19th amendment also debarred dual citizens from contesting Presidential and parliamentary polls. This rendered Mahinda’s brothers Basil and Gotabhaya ineligible to contest. This was the second blow. 19 A also raised the age limit to be President. Earlier it was 30 but now it was 35. Mahinda’s eldest son Namal Rajapaksa was born in 1986. As such hee would only be 33 next year and therefore cant seek the presidency even if he wanted to. This was the third blow. Still there were many silver linings in the dark clouds. Chamal stated that he was not interested in the presidency. Basil indicated that he was not willing to give up his US citizenship thus ruling himself out of the presidential candidacy race. Gotabhaya however was willing to renounce his US citizenship and contest the presidential poll if nominated as candidate. Some of Mahinda’s political minions began exploring the possibility of making Mahinda Prime minister with executive powers. With the ewly formed SLPP winning splendidly at the local authority polls it appeared that any candidate with Mahinda’s backing could romp home the winner in the presidential stakes. This rising tide of optimism within the Rajapaksa camp also started ebbing with distressing news of simmering tensions within the Rajapaksa extended family. Much of this was due to the 19 A ill- effect it was felt. In the absence of Mahinda who among the Rajapaksas could contest the presidential elections? was the 18 Billion Dollar question. Sri Lankans with political animal instincts began indulging themselves in the engaging pastime of Rajapaksa watching. Real or imaginary movements within the house of the Rajapaksas caused quite a buzz. Speculation was rife and the rumour mills began working overtime.The political grapevine began humming with sensational dollops of news about dissension and divisions. It was as if the Rajapaksa family was tearing itself apart over the Presidential candidacy stakes. It was against this gloomy backdrop that the “Pater Familias” of the DA Rajapaksa family initiated a proactive move to resolve differences and forge unity. Though Mahinda is the most powerful and influential member of the family he is not the head of the family according to socio-cultural norms. In the absence of parents that honour goes to the eldest son in the family. Chamal Jayantha Rajapaksa born on October 30th 1942 is the eldest of Don Alvin and Dona Dandina Rajapaksa’s nine children comprising six boys and three girls. Mahinda is the third child. Chamal Rajapaksa arranged for a meeting of the Rajapaksa siblings in late March this year. The meeting was held at the residence of one of DA Rajapaksa’s daughters . The Rajapaksa brothers and sisters converged at the venue without their spouses or offspring being present. The objective of the family conclave was to unanimously select an alternative to Mahinda to contest the Presidential elections. The selected candidate would contest polls and hopefully win the elections. Thereafter he would take steps to transfer power back to Mahinda Rajapaksa. The methodology for this would be devised at the appropriate juncture depending upon the prevailing political circumstances and environment. Until such a transfer of power is effected the chosen candidate would abide by Mahinda and be guided by him. Chamal Rajapaksa declined to be the chosen candidate. Basil also opted out. This left Gotabhaya who like the Dickensian Barkis was “willin”. Gota said that he would renounce his US citizenship in due course and that the entire process would not take more than two to three months at the most. Basil also extended his support to Gota and said that he would help him run the Govt if elected. It was agreed that Mahinda would remain head of the party while Gotabhaya would be the presidential candidate.Mahinda also said that it would be premature to announce the candidacy now and said he would do so when the time was conducive. This was agreed upon. Thereafter the Rajapaksa family demonstrated through their actions that they were closing ranks. Mahinda and Basil visited Gotabhaya’s “Viyathmaga” office publicly. Gota reciprocated by visitig the SLPP party headquarters officially. The Rajapaksa siblings also re-iterated that there was no dissension among them in media interviews. Everything seemed hunky – dory and it seemed to be only a matter of time before Mahinda would officially announce Gotabhaya’s presidential candidacy. But then as the Scottish poet Robert Burns observed “The best laid plans of men and mice and men often go awry”. Likewise something seemed to have gone wrong with the Rajapaksa family plans and there was soon discord. The family consensus on a presidential candidate does not appear to be valid any more. The arrangement arrived at by the Rajapaksa brothers has not been fully accepted or endorsed by all their spouses or offspring. Contradictions seem to have emerged between some nephews and their uncles. It appears that Gotabhaya is being opposed within family circles. Mahinda Rajapaksa’s interview with “The Hindu” newspaper and subsequent discomfiture over attempts by respective camps to interprete it to their advantage strengthens this impression further. What then could have caused this state of affairs? The possible answers to this question would be explored in a forthcoming article.